Ok. This is distressing – all three of my most anticipated tracks of the month have all made me go ‘Erm?’ and not necessarily in a good way. I’ve already mentioned that I didn’t get ‘I Don’t Feel Like Dancing’ – I have tried giving it a go, but I still end up in the same place -it’s fun, but it ain’t no classic. The next track that I searched high and low for was ‘When You Were Young’ by The Killers – hoping for something anthemic in the vein of the their debut album or perhaps a change of direction – instead it feel like Killers-by-numbers or Meatloaf meets Bruce Springsteen – an album track perhaps, but this is no way to kick off an album. 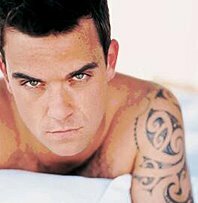 Lastly, Robbie William’s much hyped move from ‘rock to electronica’ (according to the Sunday Times) has left me confused. It starts off a bit like Jacques Your Body (Les Rythmes Digitales) and then goes into an odd 80s rap with electro squelches and a minimal drum machine backing – the oddest thing about the song for me is the lack of humour or self-pity that is characteristic of a lead RW track. I’m torn about this track – part of thinks it’s utter shite, but then in the usual RW way, it kinda niggles under the skin and sort of stays there. What the track needs is a really good remix to give it that dirty 80s electro-funk feel it’s kinda of aiming for. The one thing I have to say though, is kudos to RW for trying different things – although I’m not sure EMI is looking for experimentalism as opposed to a chance in hell to recoup their original squillion pound investment. (For all your RW updates take a trip to A Risk Each Day) – he’s still a handsome fella tho. I think I may go into hiding till the hyperbole dies down. Ok – this is not what I was expecting – Scissor Sisters are back and the seem to be channelling the Bee Gees over what seems like samples of the piano riff from ‘Oh What A Night’ in the background for the first single I Don’t Feel Like Dancing from their (at least at casa Homoeclectic) sophomore release Ta-Dah. I have mixed feelings about this – the track has a certain Saturday night strut across the floor appeal, and at times it feels like SS are trying to write their own ‘Comfortably Numb’, but at the same time, given how much we loved their debut album the track feels like a bit of a let down. On monday, Razorlight release their second album titled Razorlight. The album is an unforgettable short, sharp shock - with just 10 songs spread over 35 minutes it never gets the chance to outstay its welcome and touches on everything great about classic, epic rock from the past 30 years. It’s a refreshing old-school pop album that conforms to the truth that less is more – musically it’s a pared down, intimate feel. p.s. Blogger is f*cked – so no pics on posts till they fix the problem. Now you’ll either love this or hate this. It’s a mystery no one has thought of this before; The Puppini Sisters embrace such wartime originals as "Boogie Woogie Bugle Boy (From Company B)" and "Mr. Sandman" alongside period-style versions of such pop/new wave hits as Blondie's "Heart of Glass," Kate Bush's "Wuthering Heights" and the Smiths' "Panic." Marcella Puppini formed the trio, "The Puppini Sisters" in September 2004 with Stephanie O'Brien and Kate Mullins on a lark – what would happen if you updated the Andrews Sisters? Marcella is the husky brunette who loves red lipstick and high heels and worships the old school Hollywood divas. Kate is the feisty blonde with a penchant for black eye make-up and beer gardens, and Steph is the cheeky redhead who loves pouting and camp glamour. Personally, we are a big fan of them, and have had their debut album Betcha Bottom Dollar on nonstop (whilst I’ve been trying to seduce american servicemen and draw stocking lines down my legs). Betcha Bottom Dollar is out in the UK on 31st July. Pop into their rather fabulous site while you’re waiting. Roundly touted as a Swedish Bright Eyes, Loney, Dear is the alter-ego of Emil Svanängen - a Stockholm-based multi-instrumentalist who records at home or round his folks' house. 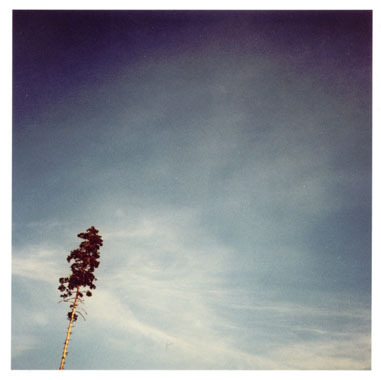 Sologne is 10 songs of Swedish psych folk sung in English with a strong indie pop flavour. with a cascade of acoustic melodies showering the self-referential lyrics and Waltz-themed time signatures in a warm, home-spun haze that is an OC producer's dream. Loney Dear will fit perfectly in your collection along with Death Cab For Cutie, Arcade Fire, Grizzly Bear, and Architecture In Helsinki. Go to Club Contact immediately and download the superb There For The Grace Of God. The song has to be one of my top 3 favourite disco records ever. Yes, ever. Yelping, screaming, angular indie-pop but with tunes; Elle Milano passed me by when they released their debut EP earlier this year. On a recommendation of a friend I decided to check them out, and we like what we hear. 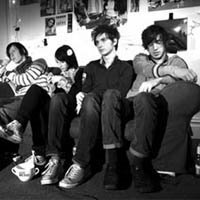 Elle Milano are a four-piece indie band based in Leicester, England, formed by the indie fashion models Adam Doherty and James Iha, formerly of the band Psirens. Their debut EP Swearing’s For Art Students is out now. As part of their ‘80s Issue’, Q Magazine has attached a free CD with modern covers of 80s tracks. Featuring the likes of The Futureheads, Teddy Thompson, Placebo and The Boy Least Likely To. Some of the covers have been released before by the artists as B sides, whereas others have been recorded especially for Q. Seeing as you can get 15 tracks for the princely sum of £3.90 (or a pint of beer in the west end), I encourage you to buy the mag to get the tracks. For those not in the UK, a couple of tracks off the album below. …but it’s very busy in the real world, and we’re struggling to find time to post – but more stuff should be up this weekend (incase you thought I had gone to the blog graveyard in the sky). One from the vaults here, for you whilst I’m listening to the current crop of new albums. 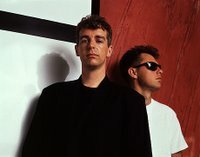 Bubadubadubadum (aka "All My Wasted Time") is a rare Pet Shop Boys demo from the early days, recorded well before they hit it big. It’s a simple, new waveish synthpop track; with Neil singing along to Chris’s synthesizer, but it works quite well. In fact, that potentially embarrassing "bubadubadubadum" motif is so outrageous that it comes across as charming, if naive. Lyrically spare (the same verse and chorus repeated three times), it appears to be about a guy losing patience from being "put on hold," so to speak, by a hesitant lover: "Waiting through the afternoon, one thing on my mind. But there's no way to recompense for that." By the way, the number of "dubas" in the title seems to be a matter of dispute. It's also been written as "Bubadubadubadubadubadum." 14 years after his last release, Limahl is back with a new single. Released in Germany as a result of his appearance on a reality TV programme, Tell Me Why is a euro-pop track that explores the break-up of a marriage. Whilst catchy enough, it sadly isn’t the pop classic that the always self-effacing Limahl deserves.